The snail-paced rollout of Windows 10 version 1809 is still ongoing as development of Windows 10 version 1903 continues to push new features that might be supported in the next feature update for Windows 10. Microsoft has not changed the schedule yet; Windows 10 version 1903 is expected in late March or early April 2019. Users who run Insider versions of Windows 10 can test some of the functionality already. Microsoft tests a new feature in File Explorer currently that displays the data in conversational format. 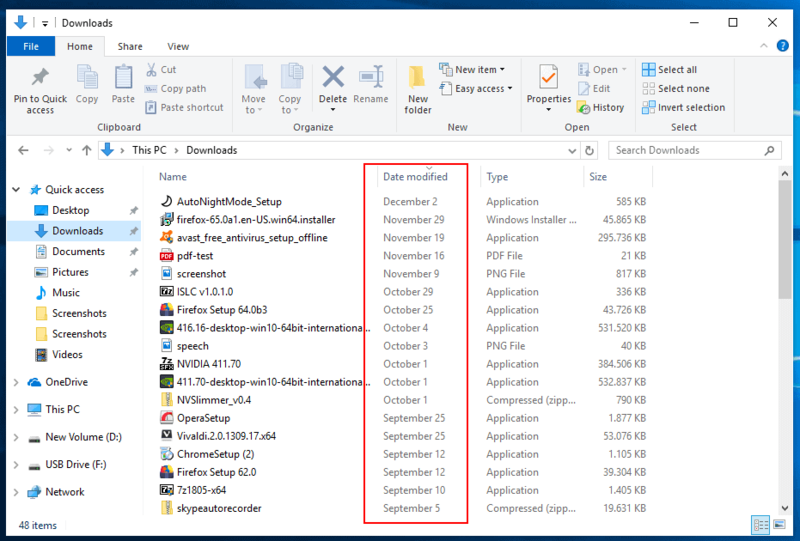 File Explorer, the default file browser of Windows 10, displays modification dates by default. The dates that it displays uses the format day-month-year-time, e.g. 04-Oct-18 09:26 AM by default (as do other date listings such as creation date). 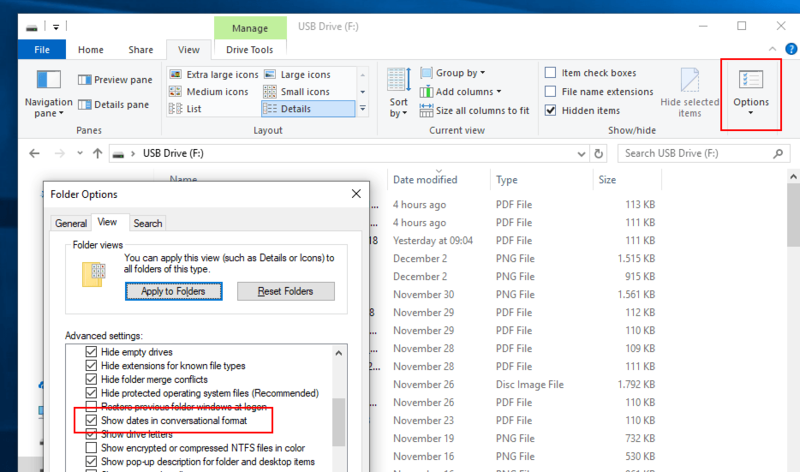 The new conversational format for dates in File Explorer changes this to a format that removes the time parameter from the listing in most instances and changes the date as well. File Explorer displays dates such as August 4, 2010, Yesterday at 13:26, or "just now" instead in listings. Current year dates omit the year. All dates older than 2 days are displayed in the format Month Day, e.g. November 29. Yesterday: displays the modification time. Today: displays "hours ago" or "just now". 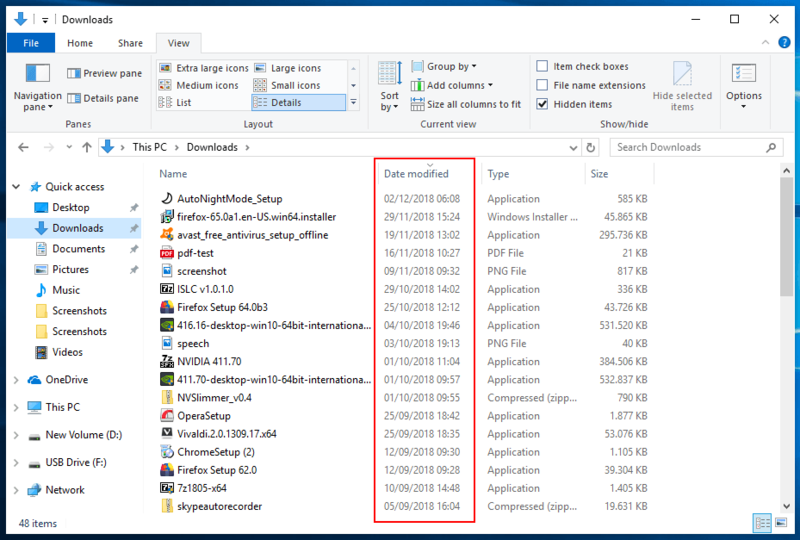 Sorting works as expected; File Explorer takes the full date and time into account and sorts the file and folder listing of the active folder based on that. Open File Explorer on Windows 10. Select View and click on the Options button. Switch to the View tab in the Folder Options window that opens. Scroll down until you find "Show dates in conversational format". Check the option to enable the new conversational format and uncheck it to turn it off and go back to the default format used in previous versions of the Windows operating system. Open the Registry Editor on the system. Tap on the Windows-key to display Start, type regedit.exe, and select the result to load it. If it does not exist, right-click on Advanced and select New > Dword (32-bit) Value. Double-click on the value and set it to the value 1 to use the new conversational format or to 0 to use the old date display format. Microsoft did add dark mode to File Explorer in Windows 10 version 1809. Microsoft plans to add a new date display format to File Explorer in Windows 10 version 1903 called conversational format. Placing the month before the day should be prohibited. By law! Minus the “yesterday”, “x hours ago” stuff, which imo is just bad design. I agree, and I live in the US where this is standard practice. As a programmer, the only format I consider acceptable is to go from the most significant to the least significant. In other words, year-month-day. It makes things sort nicely. While I’m complaining about American weirdnesses, I also wish we’d ditch the imperial measurement system entirely, and I wish that we’d start measuring cooking ingredients like flour, butter, etc. by weight rather than volume. I do all of these things in my house, but that doesn’t help when talking with my neighbors. You raise a very good point about the imperial system. I watch a program called Mayday. It’s about airline crashes. There have been plane crashes associated with confusion between imperial and metric fuel volumes. Unfortunately, it’s going to take the death of someone very prominent to make the US and other imperial users change their ways. I remember reading a news years ago about Spacecraft that’s going to Mars were gone because US used imperial calculation with metric system. Since then, I heard that NASA was slowly changing to metric system, the same with airlines companies. Agreed, YYYY-MM-DD should be the standard. What ASCII date is 01/02/03? Because there is no standard, it’s impossible to tell. This is a newsworthy paradigm shift. This is one of the many things I like about macOS, was wondering the other day why Windows hadn’t done it. But then there’s a big list of things you wonder why they haven’t done. Still waiting for thumbnails of documents that they sort of had for Adobe files at one time and then got rid of. I like having the option to change the way dates are displayed in File Explorer. This is similar to how dates are displayed in Outlook. No, 19H1 is the codename for 1903, like Redstone 1 to 5 was for 1607 though 1809. Microsoft is trying to dumb down file dates by showing things like “just now” or “yesterday” That’s just plain stupid. We all use the full date and time to look at file systems. Making it understandable to two year olds makes no sense at all. I pitty anyone who uses the windows (file) explorer. Cant think of windows w/o total commander (windows commander before ms stepped in, or norton commander in dos times). Once you get used to TC (or clones) youll never want to go back. So much faster, easier, way more powerful. A must have on usb stick. I agree with rlesch. Use a decent file manager rather than Microsofts’s rubbish. My choice is FreeCommander. Once you use a decent dual pane file manager you’ll struggle with anything else. As for dates and times, ISO 8601 has it covered for any technical formats. I use year.month.day format. Easier to sort by date. Not a format I will ever want to see become standard in Windows. Just dd/mm/yyyy suits me perfectly.